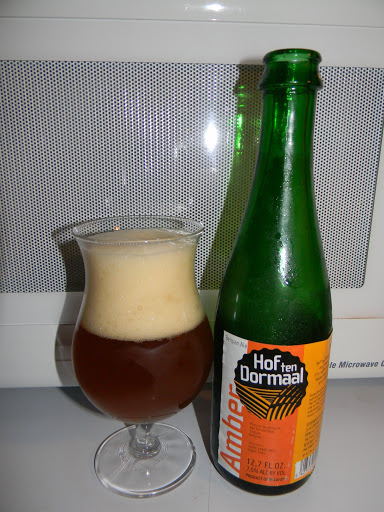 Hof Ten Dormaal | Beer Apprentice - Craft Beer News, Reviews, Interviews and Info. Hi guys. I hope everyone is doing well. For today’s craft beer review I’m going to be trying the Hof Ten Dormaal Amber produced by Brouwerij Hof Ten Dormaal located in Tildonk, Belgium. I wasn’t able to translate the description from the breweries website, hoftendormaal.com, to English, so I checked on ratebeer.com and found this bit of information. Amber coloured, top fermenting beer. Brewed on the farm with respect for the old farm traditions and from a careful selection of our best barley and hops. This beer has an ABV of 7.5% and it comes in a 12.7 oz. bottle. It poured a cloudy, amber color with an off white head. A medium aggressive pour produced a cap of great size with a soapy, fizzy and rocky texture. The retention time was not as long as I thought it was going to be, but it still hung around for a few moments. The lacing was surprisingly thin and insignificant. It fell back into the liquid relatively quick. The bouquet was not extremely robust. I did find a little bit of yeast and a little bit of clove spice though. I also discovered a pretty decent tone of red apple and a solid dose of sweet caramel malt. Those two aspects seemed to come through as it warmed to room temperature. I thought it may have a big nose of funk and/or sourness, however it didn’t provide a great deal. Overall, not a bad fragrance though. The flavor released a bit of alcohol at first, yet after a few moments it was masked by ripe fruits of apple and grapes as well as some bready undertones. Hints of caramel sugar with some spicy clove. It was also a touch “earthy” too. The taste wasn’t overly loud or robust either. Again, not bad, but not nearly as pronounced as I thought it was going to be. The mouthfeel was medium bodied. Mostly dry, prickly, lively and crisp. Medium to high carbonation also. A nice bit of warmth was felt at the back end and a decent bit of flavor was left behind on the palate between sips. Essentially, I thought this was a respectable beer. It got a lot better as it warmed and began to open up. It kind of tasted a bit like a young, delicate Belgian Quad. The drinkability was good and I had no problem getting through this bottle. I’d happily drink it again if it were offered. Easily worth a try if you happen to see it. So, with that being said, give the Hof Ten Dormaal Amber a try if you have yet to do so. It may be the beer you’ve been looking for. Be sure to let me know your opinion of it as well. Thanks for reading everyone. I’m greatly appreciative. How’s it going everyone? Well I hope. 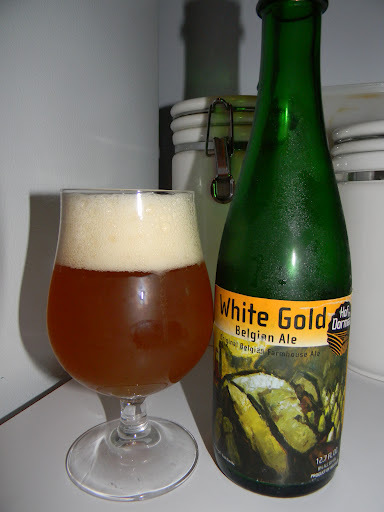 For today’s craft beer review I’m going to be drinking a Hof Ten Dormaal White Gold (Wit Goud) produced by Brouwerij Hof Ten Dormaal located in Tildonk, Belgium. I had never even heard of these guys when I saw this bottle on the shelf, so I figured I’d give it a go. I mean, it’s from Belgium. How bad could it be???? Right??? I couldn’t get the website, hoftendormaal.com, translated to English and I couldn’t find any other commercial description about the brew, so I guess we just need to drink it for ourselves and see how it is. This beverage comes in a 12.7 oz. bottle and it has an ABV of 8.0%. It poured a hazy, orange color with an off white cap that was greatly sized. The texture was soapy, rocky and kind of fizzy. The retention time was terrific as was the lacing. A lot of bubbles were seen rising to the top from the bottom of the glass. A very nice looking beer I thought. The nose expressed hints of lemongrass and a little bit of fruity orange. A very light funkiness was discovered along with a solid dose of wheat as well as some spicy pepper and clove. It had a sturdy backbone of bready malts too. Deep within the aroma, and noticed somewhat after it warmed, I began to discover some sort of a soapy detergent type of fragrance. It didn’t stick around too long though. I’m wondering if that was from my glass. I, literally, had just hand washed it moments before I poured the beer. Oh well, it disappeared after only a few minutes. (I’ll remember to rinse it out better next time for sure). The taste was much better. A substantial amount of peppery spice really gave it some bite as well as a solid dose of bitterness was had from savors of orange and lemon citrus. An easy going quantity of funk and light sourness started to blend well with the bready/yeasty malts as it warmed a touch. A sound amount of grassy hops were released too. Overall, it seemed to be altogether harmonious and balanced very well. The mouthfell was medium bodied. Dry, spritzy, lively, refreshing and crisp. The carbonation was very vigorous as well. Just a smidgen of warmth was felt, however I couldn’t determine if that was from the generous supply of peppery spice or the alcohol. No matter. A nice bit of flavor was left covering the roof of the mouth, tongue and throat for a few moments after each sip. Essentially, I thought this was a very good beer. Aside from the somewhat “off” smell that I received, which could have been from my own carelessness, I found it to be very nice. A great brew for the warmer weather of Summer. It did begin to get pretty spicy at the end, but that wouldn’t deter too much from the ease of drinkability in my opinion. I’d love to pick it up again sometime that’s for sure and I’d suggest that you guys do the same if you see it. So, give the Hof Ten Dormaal White Gold (Wit Goud) a try sometime. You may really enjoy it. I did.